Between 1991 and 1996 Jana and I completely landscaped our yard in Portland, Oregon. 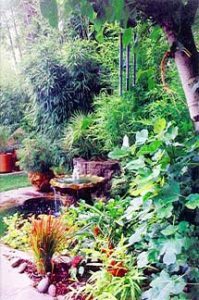 We constructed two ponds, one a Koi pond with two water falls the other a water garden with a fountain, many retaining walls went up, we raised some areas of the garden by 24 inches, added lots of fencing and built many paths to and from various sections of the gardens. We built two decks one with a palapa and a sun room was added to our home. I won’t even mention the dry well we installed (never again!). 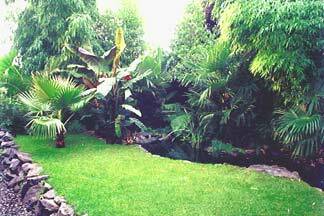 During this time we planted forty palms and over a dozen varieties of bamboo and tropical plants, like bananas, elephant ears, ferns and many other unusual and exotic botanical wonders, some hardy and some not. Both Jana and myself took great pride in what we accomplished and enjoyed many hours in our Pacific Northwest tropical paradise. This was truly a labor of love…. Left is the water garden and the sun room is to the right. 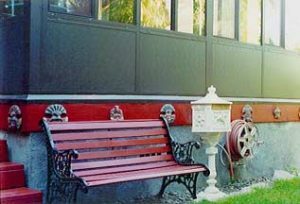 Notice the retaining wall and path next to the sun room, this was part of our cold air drainage system, most winters this was a very frost free section of the garden. Still tender plants such as the bananas were dug and placed in the green house during winter months…….. This image shows a raised area of the garden and again the cold air drainage system. This image shows the raised area of the garden and the Koi pond. 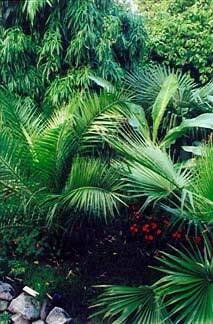 Palms are Washingtonia robusta, Phoenix dactylifera and Trachycarpus fortunei along with Musa ssp. (bananas) and Bamboo which are Phyllostachys bambusoides (Timber bamboo) P. vivax and Phyllostachys nigra megurochiku. 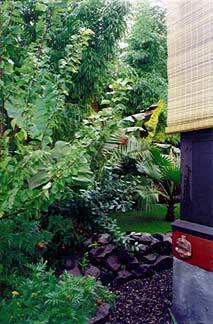 Palms are Phoenix dactylifera and Trachycarpus fortunei,Bamboo in the background is Phyllostachys nigra megurochiku. 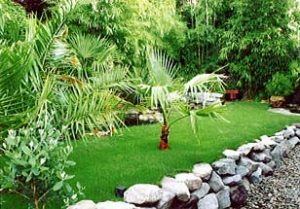 « summer in south Texas palms and tropical plants	» Why Buy a Metal Garden Hose?